The Bayreuth III Bike Bag Large from VauDe is made from durable PVC-free material with a fabric look to it, and welded water tight. Your laptop will find a safe spot in the padded compartment, while your folders and documents will fit neatly into the main compartment. The adjustable Plug and Ride attachment rail lets you attach and detach your bag from the gear rack in an instant. Little "feet" on the bottom keep it upright when it's placed on the floor, and the carrying handle and softly padded shoulder strap ensure that carrying never becomes a problem. 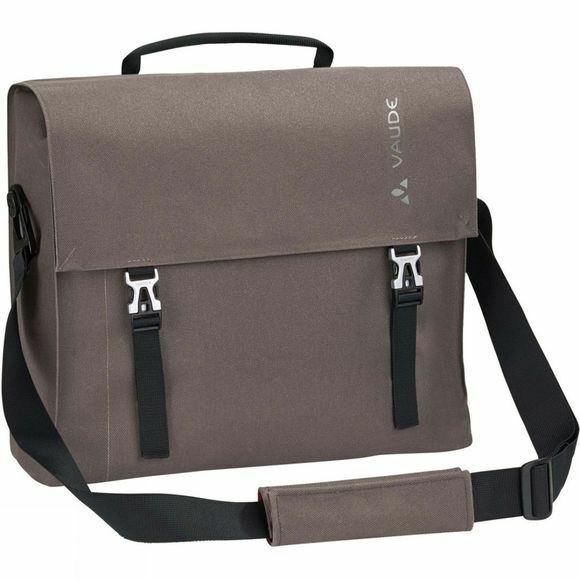 Added feature: The bag is climate neutrally manufactured at the VauDe company headquarters in South Germany, with a clean design and highest quality.